It's Friday so typically Mitchell's has fresh fish, usually snapper and I think it's local. There was also half a cabbage on sale so I picked it up. I got started cooking late so I didn't start out ambitious but it tasted that way by the time I was finished! First I got the rice on. Salt, olive oil, lemon juice and a few drops of Tabasco Sauce then into the microwave. If my microwave didn't have a 'Rice' button I'd have a rice cooker. Next I got the bones out of the filet and cut off the extra bits of skin. I was afraid I over salted the snapper but it was delicious so I guess I found the sweet spot. After salt I sprinkled Cajun spice over it. Put plenty of oil in my pan but didn't get it hot yet. The slaw started out with a handful of chives from the garden chopped into the bottom of the bowl, maybe a tablespoon or so. Then I diced up a stick of celery because it's Fern's favourite vegetable so I always try to work it into the meal. Next I took thin slices off the head of cabbage till I had about a cup of shredded leaves, I picked out the chunks. Then I diced up two tomatoes. I looked at the salad bowl and decided two tomatoes would overwhelm it so I added only one. Next I diced up over a tablespoon of fresh parsley and added that. I had more stuff in the fridge but wasn't sure more would be an improvement so I stopped there. I drizzled about two teaspoons of olive oil over the salad and one of canola oil. Salt, probably about half a teaspoon. Mixed black pepper and several drops of Tabasco sauce. Juice from half a lemon. I tasted it, it was interesting, not necessarily good. I left it for a bit while I got the pan hot for the fish and put it on to cook. When I turned the fish over in the pan I added the second diced tomato with a pinch of salt to the sides of the pan and spread it out so it would cook a little. I plated the tomato on the side but Fern mixed his into his rice and said it was fantastic that way, so I did it and he was right. 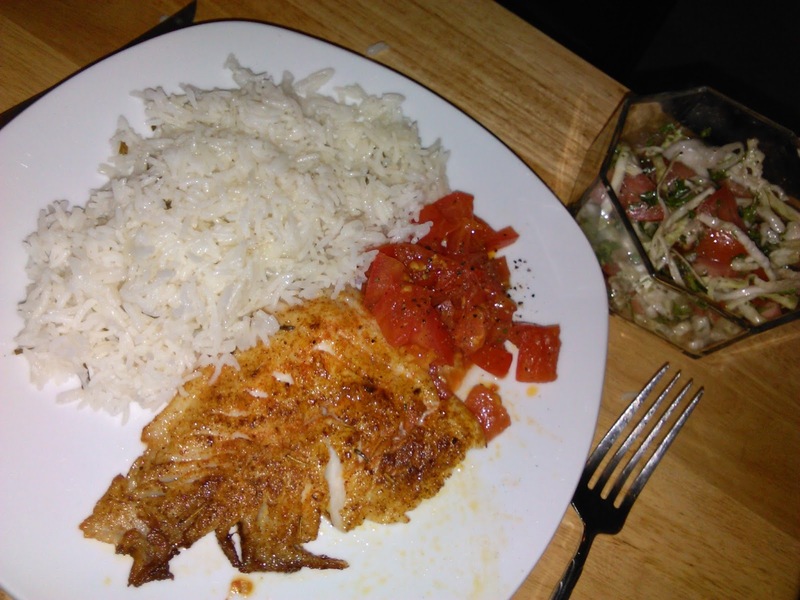 The Tabasco, tomato and snapper pan flavours brought the rice to life. Definitely going to do that again. I drizzled more lemon juice over the snapper on the plate and turned to plate the slaw. I looked at the bowl for a second and thought, the cabbage really needs a little sweetness so I sprinkled about half a teaspoon of sugar over the bowl and tossed it again before serving. This is dangerous because Fern doesn't like 'sweet' meals but if I don't use too much it's usually an improvement. 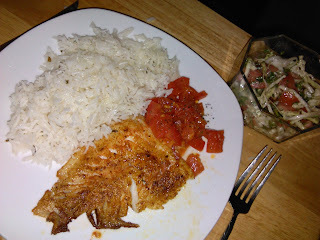 I'm not sure if I got the salt perfect or the fish just tasted better than usual but it was unusually good. Paired with the tomato rice it was a delight to eat. The slaw was absolutely amazing! We both really enjoyed it and look forward to it again. That really surprised and pleased me.